Anyways, on to my outfit... I am wearing my fave turtle neck top. 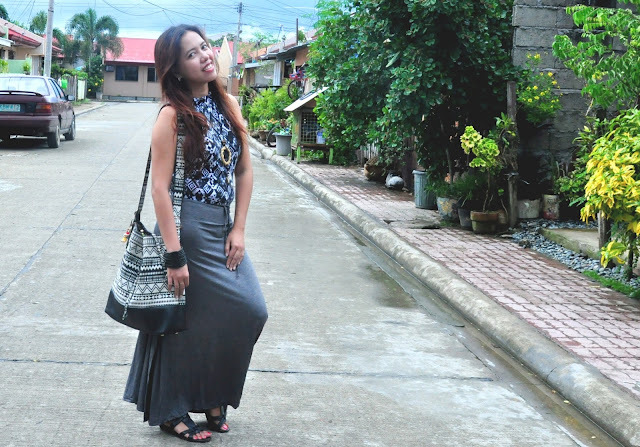 I just love the cloth of this top which matches very well with my new maxi skirt from LightintheBox.com. This combo just scream comfort! I have been eyeing this maxi skirt for quite a long time already from other online store but only this time I finally have it. It was so worth it. Its not thick and not too thin, very flowy and comfortable. Tip: Its sold in one size only and its a bit too tight on my waistline, I'm size 28 by the way. So just a heads up to anyone interested on this skirt. The aztec duffle bag is my another new fave. I bought it at SM Department Store at a sale price last month. I really like it because I can put everything on it. Perfect when I work outside coz my 15" laptop fits on it. Lastly, the dream catcher necklace... I bought it when we went to Bohol last summer. Have you tried online shopping at LightintheBox.com? Happy late birthday ! I love your maxi, it looks so comfy ! I would totally wear something like this for Cochella! So awesome! That skirt looks absolutely beautiful on you! Beautiful look! Hope your birthday was wonderful! Have a fun Sunday! Love the skirt and your turtle neck top! Happy 30th Birthday! You look amazing the outfit is spot on! Love the skirt! You look fabulous♥♥. Happy 30th Birthday! Hope you had a wonderful day :) You look wonderful in that skirt and it's so versatile, will go with everything! I agree with you Emily. Thank you for the greetings. Pretty look! Really nice outfit. Such a damn Cool look!!! You look absolutely stunning! I really, really like the top! you look so great in maxi! I really love the necklace that you paired with this outfit. The whole time I was scrolling I was trying to figure out if it was part of the shirt. The gold detail is a win in my book! You look adorable! Love that maxi! Fabulous! I love your top and bag! OMG you don't look a day over 21! Seriously! I'm turning that awful number in January and already having anxiety over it. I don't want to be 30 just yet but I decided that if I have to be then I want to turn it in Vegas. Somewhere VERY far away from home. Hopefully it'll take those woes away. Just by watching your photos, I suddenly feel the guts to wear turtle neck tops. Huhu why you all look so nice with that? Haha and also the Maxi Skirt. Ugh I always feel not tall enough to wear that huhu. But yeah, you look so good! Hi Lou! Turtle necks are my faves. Im not tall but I seriously didnt think of my short height when wearing maxi skirts. All I think is that i love to wear it and thats probably thats what you see when I wear it. And I'm loving you in this turtleneck top, I've been loving the turtleneck trend lately (which is funny since I hated them so much as a child). Happy Birthday, beautiful! I wish you many more years of joy, health and wealth! I love your outfit, that top is perfect and looks amazing with the skirt! Great pairing, you look lovely. Venus - you are just the cutest! Love the skirt - looks so comfy, yet so chic! Thank you Vanessa! Yes Im so happy it was worthy item from LightintheBox.com. Happy belated birthday my maxi skirt goddess! I am sorry to have missed this special day of yours. I understand the turning off FB to see who really actually remembers/cares/makes the effort. 30 looks excellent on you and I hope you start celebrating each new age as an achievement. It's not self centered, it's saying hey I made it through that year, a cause for celebrating! Also, check out my latest blog post as you are mentioned in it. I am SO sorry it took me so long to get it all together! Those are some killer shoes! I just stumbled across your cute blog! I love your style! Aw, Happy 30th Birthday, Venus! I don't celebrate birthdays at all, too, but I think when you reach a milestone age, a birthday celebration is well deserved! Loving your top; I need to get a sleeveless turtleneck ASAP! You look pretty, happy b-day!